Expect Amsterdam to delight you, whether you see it under blue skies, through a light drizzle, or even alongside the biggest crowds of high season. The Dutch capital mixes Old World charm with progressive modern attitudes, making it one of the continent’s top cultural attractions and an appealing destination for visitors with a wide range of interests. Constructed on a 17th-century network of 65 canals, the city preserves architectural treasures from the country’s Golden Age while championing innovative contemporary style. The Netherlands’ location near the North Sea results in unpredictable maritime weather at any time of year, with generally mild summers, cold winters, and frequent rain. The Dutch pay no mind, carrying on with festivals (more than 300 take place in and around the city each year!) and leisure diversions no matter the weather—and so should you. The best time to visit Amsterdam might arguably be whenever you can go. However, a flexible travel schedule gives you some options. 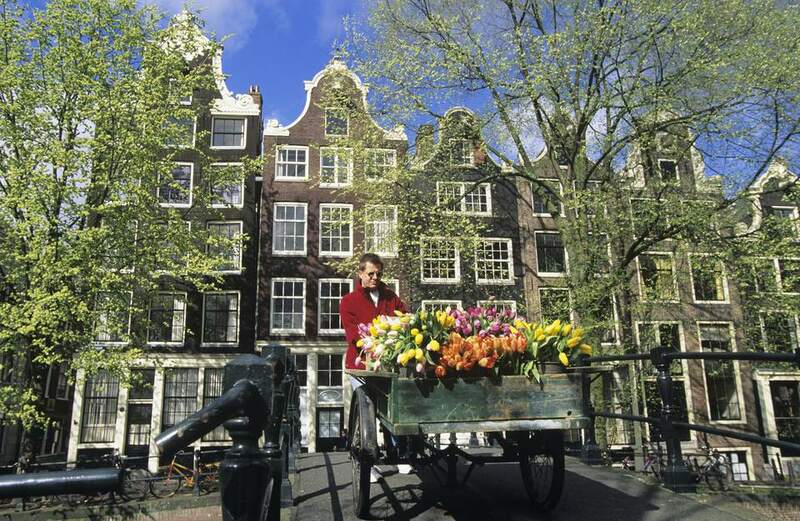 In general, most tourists visit Amsterdam between April and September, when the long summer days and milder temperatures make sightseeing a pleasure. But winter turns the snowy city into a picture postcard of fairy lights, and the shoulder seasons in spring and fall see fewer crowds and often the most desirable weather. Similar to most cities, hotels in the downtown area can be pricey. But it's still possible to visit on a budget. Once you arrive, opt for alternative accommodations; backpackers find a wide variety of lively hostels, while those who prefer a tad more privacy can veer toward Airbnb. Pick up a museum discount pass for free entry to anywhere from 40 to 400 museums and other tourist benefits. And keep your costs down with the best cheap eats in Amsterdam. Watch the city shed its winter layers, as tulips, crocuses, and hyacinths emerge and residents gear up for seasonal celebrations heralding the arrival of spring. People head outdoors en masse to soak up the first warming rays of the sun while seasonal attractions reopen throughout the city. You can enjoy longer days and warm temperatures before the big summer crowds arrive. During the spring edition of the semi-annual restaurant week, top chefs invite residents and tourists to sample their cuisine with modestly priced tasting menus. Other highlights of spring include the reopening of the famous Keukenhof Gardens in March and the biggest holiday of the year, King's Day on April 27, when Amsterdamers take to the streets in orange-clad droves to celebrate King Willem-Alexander. With countless cultural festivals, open-air concerts, and an average of 16 hours between sunrise and sunset, Amsterdam in summer delivers a superlative experience, despite the crowds. Two of the city's top festivals take place in June. During Open Garden Days, the public can explore the stately backyards of 30 of the city's finest canal houses, while world and roots music fans listen to favorites and discover new talent at the Amsterdam Roots Festival. One of the world's most notable gay pride events takes place in Amsterdam in late July and early August. During Amsterdam Pride, you can watch the only gay pride parade that takes place on a canal. Another event showcasing the famous canals, Grachtenfestival, also happens in August, with classical music performances at waterside venues along the route. The leaves aren't the only things to fall in Amsterdam in autumn. Cooling temperatures in northern Europe bring cheaper airfares and hotel room prices too. As the weather takes a turn towards the blustery, the Dutch focus on cultural events and seek coziness inside favorite cafés and restaurants. For a more active vacation, you can add the TCS Amsterdam Marathon to your itinerary, go clubbing with the Amsterdam Dance Event, and free-wander the city's ocher-framed canals. In November, soak up the late-night culture of Museum Night and be the first (with 400,000 other revelers) to welcome Sinterklaas when he rides into town with a festive parade for the holidays. The holiday season is a festive, albeit cold time to visit Amsterdam, with exciting New Year's celebrations. Ring in the Christmas season and the winter holidays in Amsterdam with seasonal traditions and unique day trips. The annual Amsterdam Light Festival turns the city's waterways into sparkling art by international artists, with 35 or more large-scale installations in the city's center from late November through mid-January. Take the Amsterdam Light Festival boat tour for the best view. At this time of year, you can find low travel fares and huge discounts at stores' semi-annual sales. Show your Valentine a romantic Amsterdam with a boat ride to Vuurtoreneiland (Lighthouse Island) followed by a five-course dinner with wine.